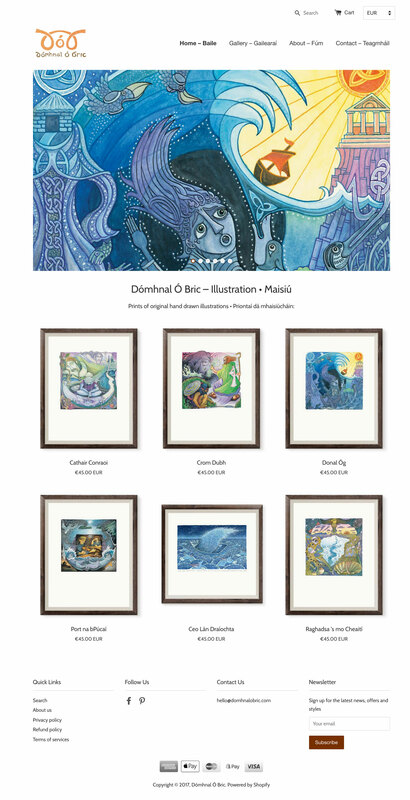 Dómhnal Ó Bric is an illustrator from Dún Chaoin in Corca Dhuibhne. He mainly illustrates picture books, cartoons and maps; he has had his illustrations published in countless Irish language books on a wide range of subjects. The client commissioned a website to showcase and sell his art work. He also wanted a campaign to kick-start sales. We built a beautiful website with an online shop. We developed and implemented a comprehensive sales campaign through social media and Google. The ecommerce website was stunning and showcased the client's work to the highest standard. It was launched in November 2016 targetting the Christmas market, which resulted in increased sales.